NAHB is helping its members and the building industry move the practice of green building into the mainstream with the NAHB National Green Building Program. The program includes a green home verification and certification program through the NAHB Research Center, a variety of green educational offerings, advocacy on green building issues, and tools and resources for Home Builder Associations whose members want to go green. In addition to the CGP designation, NAHB provides members with services addressing education, recognition and market awareness. The NAHB National Green Building Program brings together a dynamic network of voluntary local green building programs that have certified 130,000 green homes in the last 10 years. Based on the successful NAHB Model Green Home Building Guidelines, the NGBS is the first and only residential green building rating system to have gone through a full consensus process including government agencies, building officials, manufacturers, builders and environmental advocates. The NGBS covers all areas of residential construction, including single- and multi-family units, remodeling and site development. At this pre-eminent conference, attendees network and learn about the latest green practices and products for the mainstream residential building industry. These awards honor outstanding commitment and achievements among individuals and organizations at the forefront of "bringing them to the mainstream." 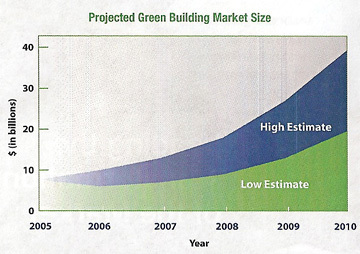 The Future of Residential Construction is Green. The Certified Green Professional (CGP), an exclusive designation offered by the National Association of Home Builders, is designed to teach building industry professionals strategies for incorporating green building principles into homes using cost-effective and affordable options. When you become a CGP, you gain a greater understanding of sustainable building techniques, knowledge of methods to achieve higher energy efficiency, marketing and sales tools specifically tailored to green building, and the business practices that foster success. You'll be able to demonstrate to consumers the enhanced environmental impact, increased performance and health benefits of green homes to potential buyers. 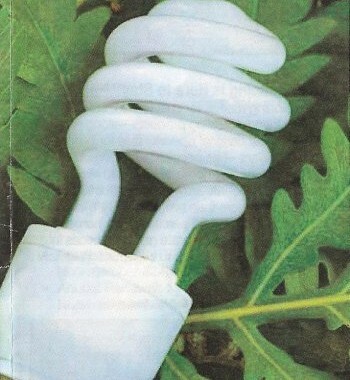 Earning the CGP shows customers your commitment to staying current with industry innovations&mdash;including green building. The exploding market for sustainable, environmentally friendly building products--along with expanding educational opportunities for builders and remodelers--has accelerated green building's acceptance by home owners and the building industry. A NAHB-McGraw Hill Construction Survey indicates that more than half of NAHB's members--who build more than 80 percent of the homes in this country--will incorporate green practices into the development, design and construction of new homes in the next two years. 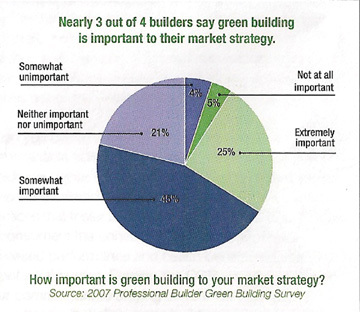 Green building is more than just a checklist. It's the use of quality building practices that promote sustainability to make a home healthier and more efficient. The Certified Green Professional (CGP) provides a solid background in green building methods and the tools to reach consumers and to provide market-driven green building solutions to the home building industry. Earning the CGP designation demonstrates to your clients and peers your commitment to the best and latest in green building practices and techniques and that you hold yourself and your work to the highest standards of professional ethics. NAHB also links consumers directly to you via an online directory at the www.nahb.org/designationsdirectory which allows home buyers and owners to easily find experienced building professionals. You'll also have access to CGP LinkedIn group and networking with experts. CGP courses are offered at local Home Builder Associations throughout the country. You can find schedules and locations at www.nahb.org/searcheducation. In addition, CGP courses are offered at national conferences such as The International Builders' Show and the National Green Building Conference. Mountain Construction does custom home building in any building style, including conventional new homes, remodeling and restorations, log and timber frame home and structural insulated panel homes. Check out our site and learn more about our Construction and Remodeling services.